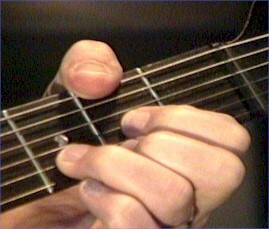 Lyle: The D/F# chord uses the thumb for the bass note. MissM: Those marks mean to pick up? Lyle: Let's talk a little about effects. The Edge likes to use a delay to fatten up the tone. In the TAB file I just sent, I'm using a digital delay setting that gives me a 1 beat echo. 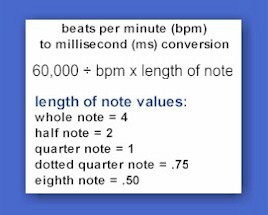 Since the jam track is 88 beats per minute, I used a delay setting at 680ms. dougp: Does he use any arpeggios? Lyle: He arpeggiates chords a lot. He'll play a chord and hit one note at a time, letting them ring together. This solo 1 is simply made from the E minor pentatonic scale ascending the 2nd string. In solo 1, you can use a clean tone or distortion. Notice I used a clean tone with just a little bit of distortion. Lyle: Do you hear the difference between the two tabs? Sam: What device do I need for a delay, I only have an Fender champion 30 amp? Lyle: Sam, a digital delay pedal. Lyle: Can anyone guess what effect I'm using in this file? 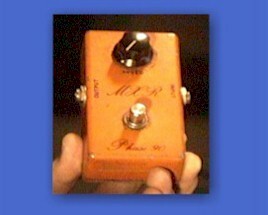 Lyle: It's a MXR Phase 90 set for a fast speed. Lyle: This is a vintage effects pedal much like The Edge uses in his setup. 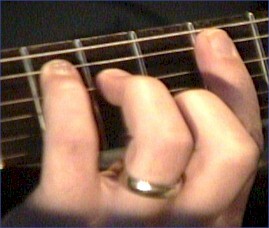 TT: Is this arpeggiating the barre chords? Lyle: TT, yes. 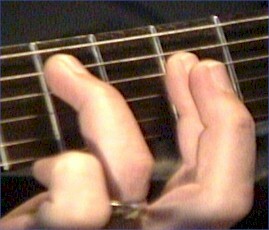 This is what arpeggiating the chords means. Ralph: that MXR pedal reminds me of the mid seventies! Lyle: Ralph, that's probably when this one was made! mark6: G chord is a little tricky. Lyle: Ok, just kidding...that was how I recorded the snare drum part with my midi guitar. Lyle: Ok, now the real muted strum technique that the Edge might use to simulate a snare drum. Lyle: It's like what Hendrix did at the beginning of Voodoo Child. P.S. Could The Edge be a Vulcan? I've never seen the tips of his ears, he always wears a hat....?